Heat 1 tbsp olive oil in a frying pan, add 1 clove organic garlic, crushed, and fry for 30 seconds. Add 400g Waitrose British Organic Mini Chicken Fillets, cubed, and fry for 7-8 minutes. Reduce the heat to medium and stir in 280g jar Waitrose Cooks’ Ingredients Grilled Artichokes, drained, or 150g Waitrose Frozen Artichokes, and the juice and grated zest of 1 organic lemon. Cover and cook for 8-10 minutes, stirring occasionally. Season and stir in chopped parsley from a Premier Pot of Parsley. 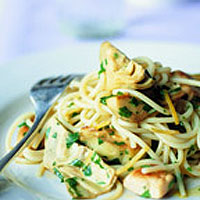 Toss together with 150g Waitrose Organic Spaghetti, cooked to pack instructions.